Congratulations: you’re still in time for some spring cleaning! Come on! There’s still weeks left before the end of the season, which means you can still to get your act together and whip your house into shape. Spring cleaning is a hassle, you say? If all you’re going to do is dust and scrape, store and organize, then for sure, the finish product won’t be as enticing. Who cares about a clean kitchen? It’s just going to get dirty the next time you don’t get take out. Then again, what if we turned spring cleaning into a whole journey? Cleaning can do great things for your stress levels, just as not cleaning can drive you crazy. I’m not making this up! Ask the good people of Psychology Today. They know what I’m talking about. Who’s ready for some spring cleaning? Set the scene. A sure-fire way of knowing that you grew up in a Latin American or Hispanic household was the sound of music roaring across the living room while the house was getting cleaned. It’s the same concept as a “workout playlist.” You need music you can dance to, sing along to, or even cry to if that’s the kind of purifying cleaning experience you want to have. While in college, my roommates and I used to blast Disney soundtracks. We surely got down to business to defeat the grime, if you know what I mean. Enlist help. I don’t know how big your house is. Maybe you live in a shoebox like me or you live in a mansion bigger than Selena Gomez’s. But no matter how big or small, cleaning with company is always better than cleaning alone. And in some cases (like Selena Gomez’s), cleaning by yourself is simply not possible. So gather the able children, your partner, your roommate, your dog if you’ve trained them well, or just trick your friends into visiting you for a cleaning frenzy. (Once you’ve trapped them, you can offer to return the favor if you want to be a decent person). Have an action plan. Divvying up work is good. “You take the bathroom; I take the kitchen” kind of thing. But beyond that, you need more aspirational plans. Once you clean x, y, and z, what are things going to look like? 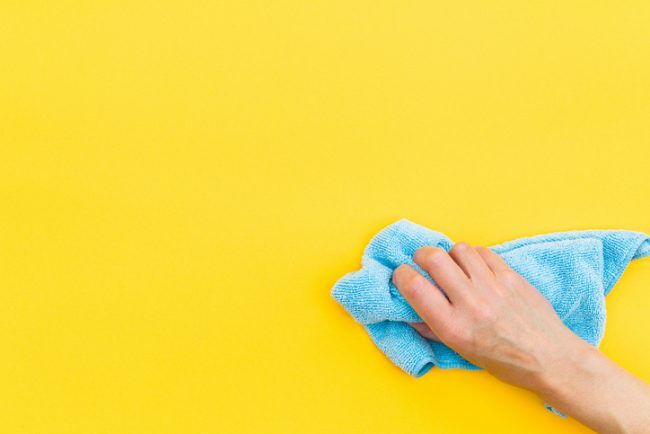 If you’re going to go through all the trouble of deep-cleaning your whole house, take advantage of the hassle to retouch, redo, or reorganize anything that had been bothering you throughout the year. Perhaps your shelving unit is falling apart, or you’ve discovered the well-intended storage drawer has gotten a bit out of control. Invest in cheap dividers for your drawers, ingenious storage boxes or hangers to keep everything organized. Carpe diem, my cleaning friends! Don’t take long breaks. Feed yourself, for sure. But don’t watch an episode of “Twin Peaks” while you’re at it. The minute you relax, all the motivation will leave your body, leaving you with a half-destroyed room. To make matters worse, it’ll only look like it was on its way to being organized to you. Everyone else will think you’ve gone a little crazy with the experimental feng shui. Stay hydrated and well-fed and take it easy as to not over-exhaust yourself, but be relentless with your mission. If it takes more than a day, it takes more than a day. This goes hand in hand with having an action plan. Don’t dismantle every room in your house at the same time. Go room by room (or several rooms if each person is taking on one). It’ll be much better if you have half a clean house than a completely destroyed house that is driving you crazy until the next weekend. Continue envisioning the big prize. Again, aiming for “just cleaning” won’t be enough to carry you through the whole ordeal. You might reach the finish line, but you won’t really feel the payoff. Keep the “before” image close to your heart, and continue picturing the “after” look in your mind’s eye. Celebrate when you finish. Pat yourself in the back, you just cleaned a whole house! Let yourself enjoy that comfort. Take a hot shower in your pristine bathtub, snuggle in bed with your clean sheets, order takeout and eat at your polished kitchen island. Congrats, you’ve just earned yourself another year of kicking it back and letting the house suffer what it may suffer. We’ll see you again next spring. The blog is filled with useful tips and guides to help you make the most of your spring cleaning. Check out our Life@Home and DIY Ninja verticals for more ideas! This is all such great advice! My family and I just finished our spring cleaning. They don’t love being roped into deep cleaning, but like you said I can’t do it all myself! I also ended up hiring a great carpet cleaner because I hate shampooing carpet more than anything. I think recognizing that you can’t do it all yourself (or don’t want to!) is so important for spring cleaning success! Thanks for sharing the article, these tips are useful for cleaning the room in this season. The article is very useful, thx for your sharing. These spring cleaning guides are very useful for this season. Thanks for sharing. These spring cleaning guides are very useful for this season. Celebrating after finishing every work is really a must. Thanks for sharing. Good job. Those tips are so eye catching and very useful. Thanks for such informative article, really impressed. Have a nice day. Quality content is the secret to interest the visitors to go to see the web page, I take pleasure in, result in I found just what I was having a look for. You have ended my four day lengthy hunt! God Bless you man.